My work is strongly influenced by world mythology, and this character was inspired a trip to the Museo del Oro (gold museum) in Bogota, Colombia, where my mother is from. 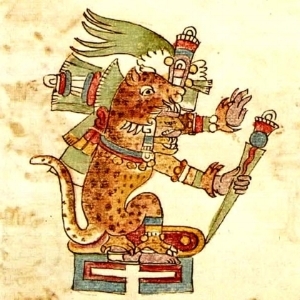 The ocelotl were elite Aztec fighters who wore the whole pelt of the jaguar into battle, believing it would it would grant them the strength of Tezcatlipoca: the god of jaguars, war, and the night sky. My interpretation was inspired by the illusion created by a warrior wearing a full pelt and the idea of one of these warriors channeling the jaguar god’s divine powers in battle, making him "one" with the pelt.